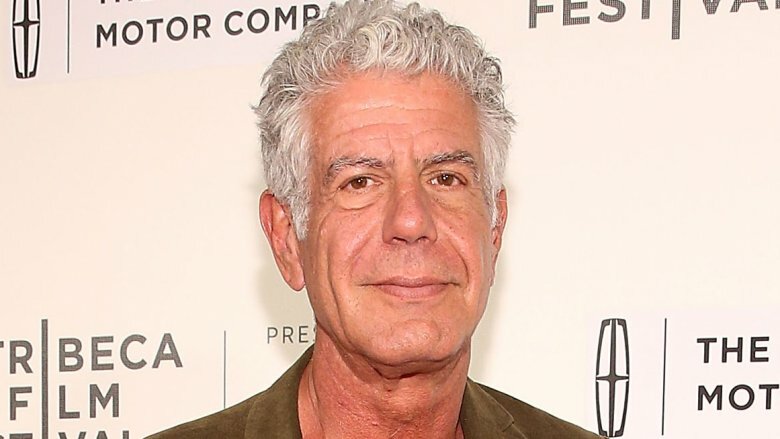 Celebrity chef and author Anthony Bourdain was found dead on June 8, 2018. The beloved television personality reportedly committed suicide in a hotel room in France. He was 61. 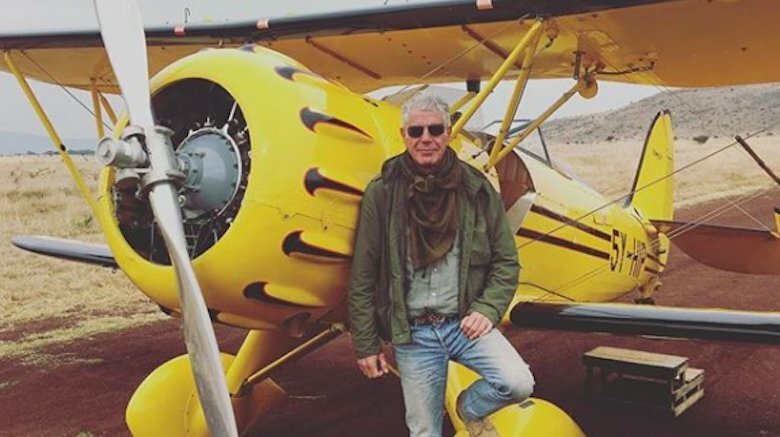 CNN issued a statement that said, in part: "His love of great adventure, new friends, fine food and drink and the remarkable stories of the world made him a unique storyteller. His talents never ceased to amaze us and we will miss him very much. Our thoughts and prayers are with his daughter and family at this incredibly difficult time." The rock star of the culinary world and New Jersey native's ascension to fame began in 2000 with the release of his comical, mordant autobiography, Kitchen Confidential: Adventures in the Culinary Underbelly and spawned a successful TV career that included appearances on Top Chef, the Travel Channel's Anthony Bourdain: No Reservations, and the CNN series, Anthony Bourdain: Parts Unknown. As celebrities and fans remember all of the wonderful moments the Emmy award-winning host served up, here are a few stories you may not know about Anthony Bourdain. Bourdain's autobiography, Kitchen Confidential: Adventures in the Culinary Underbelly (via Mental Floss), detailed a childhood trip to France, where his family was invited on a boat by an oyster fisherman named Monsieur Saint-Jour. It was on that boat that Anthony tasted his first oyster. In an interview with The Guardian, the celebrity chef said he "only became happy — in fact, intensely satisfied — as a dishwasher at a restaurant in Provincetown in Cape Cod, my first job." Describing himself as a "shy, goofy, awkward teenager," Bourdain said the "factory-like environment" of the job brought him a sense of contentment. "Dishes had to go in the washer and come out taintless and doing this swiftly and competently meant I was acknowledged as a human being by colleagues I wanted to be like," he said. It wasn't just the acknowledgement that brought him joy. Bourdain told Fresh Air (via NPR), "You had to be there on time. There were certain absolute rules. And for whatever reason, I responded to that. It was a mix of chaos but also considerable order that I guess I needed at the time." First We Feast was granted an exclusive interview ahead of the TV personality's 60th birthday. He was asked if facing such a monumental birthday was terrifying. Bourdain replied, "Yeah. Somewhere, I forget what year, I was like 44. I was like: F**k I'm old now. But no, I feel free of the nonsense honestly. I don't have a lot of regrets in my life." He added, "I'm pretty happy being a distinguished motherf**ker. The extent to which I'm free of expectations, you know, I enjoy that. The extent to which I can glide through life unnoticed is nice, too. It's freeing." 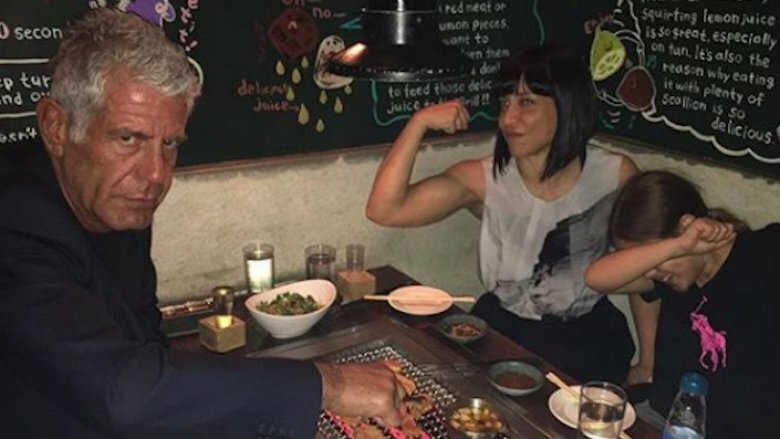 When he wasn't traveling more than 200 days per year for his CNN hosting duties, Bourdain would spend quality time with his daughter, Ariane, from his second marriage to ex-wife Ottavia Busia (pictured). Bourdain even co-wrote a cookbook in 2016 titled Appetites: A Cookbook, which featured all of the meals he enjoyed preparing for Ariane. 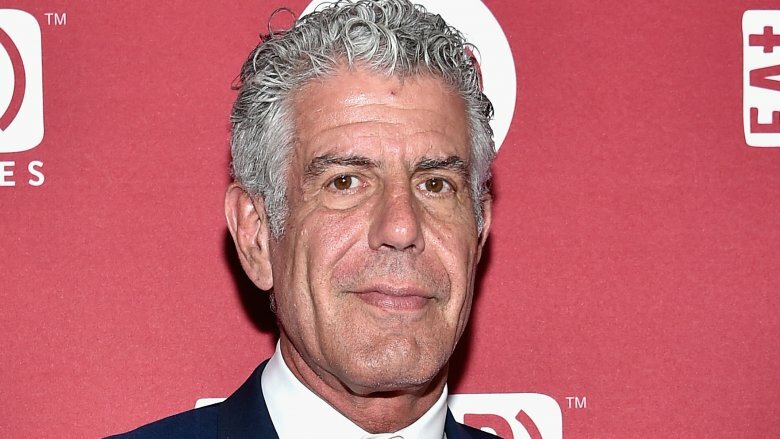 During an interview with The Takeout, Bourdain said his daughter was a "very harsh critic," despite how much he loved whipping up her favorite dishes. "You know, I put a tiny tiny little bit of nutmeg in my macaroni and cheese and she did not enjoy that. She called me on it right away," he said. According to Bourdain, Ariane has a "very acute palate" and could immediately tell if he happened to "over-salt something." "If there's any variance between a dish that she liked last time and how it's done today she'll be like, 'Nah, not eating it, there's too much pepper in that,'" Bourdain said. 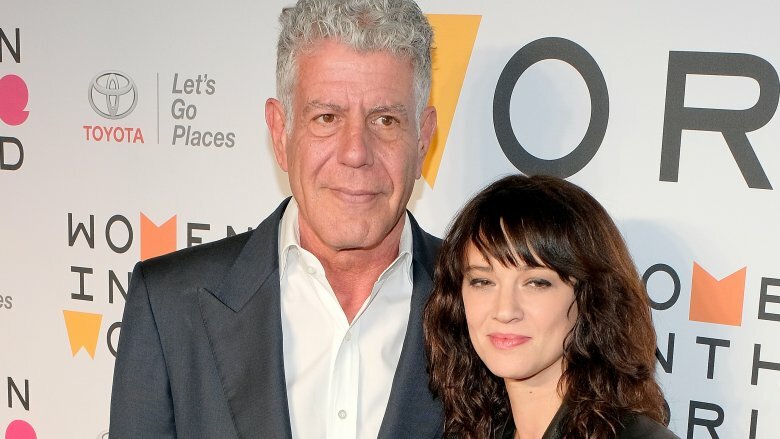 After splitting from Busia, Bourdain met Asia Argento while filming an episode of Parts Unknown in Rome, Italy. According to Page Six, the Italian actress and director soon became a romantic and professional fixture in his life, directing numerous episodes of his hit series. However, just three days before Bourdain's passing, the Daily Mail posted photos of Argento in Rome holding hands with and hugging journalist Hugo Clement. Three hours before Bourdain's death was reported, she posted a cryptic message to her Instagram Stories (via People). In the post, Argento wore a ripped t-shirt that read, "F**K EVERYONE" with the caption: "You know who you are." The status of Bourdain and Argento's relationship at the time of his death is unknown. Her friend, actress Rose McGowan, told TMZ: "Anthony and Asia had a free relationship, they loved without borders of traditional relationships." 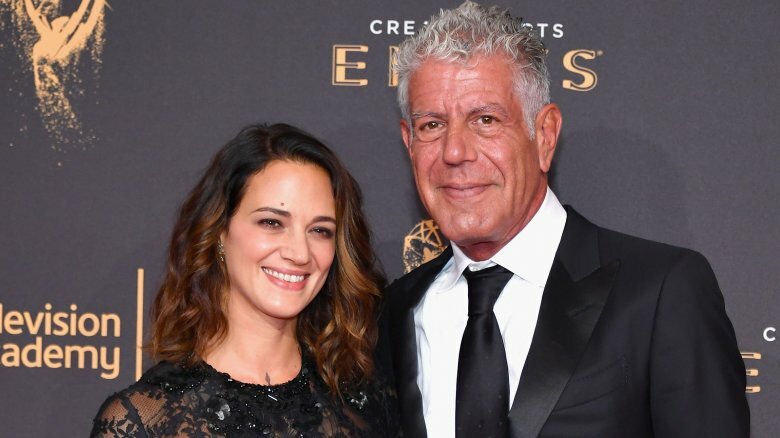 In the wake of Bourdain's passing, Argento tweeted a heartbreaking statement that said, in part, "He was my love, my rock, my protector. I am beyond devastated…"
When it came to identifying someone he looked up to, Anthony Bourdain didn't choose a fellow chef. Instead, he bestowed the honor to his friend and punk rock legend, Iggy Pop. "He has been an enormous hero of mine since the first [The] Stooges album, the soundtrack to the good and bad times of my life," Bourdain told First We Feast. 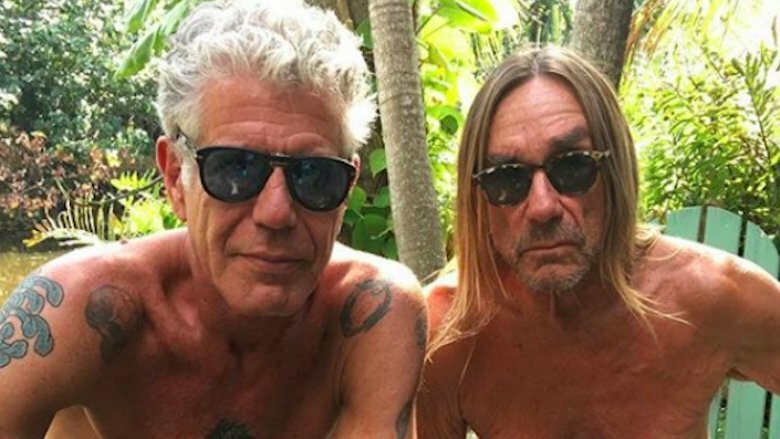 The two sparked a friendship that included Iggy Pop making appearances on various Bourdain-hosted shows, including an episode of Parts Unknown that features the pals sharing a meal in Miami. They even interviewed each other for a piece published by GQ magazine that discussed their own mortality and Twitter trolls. 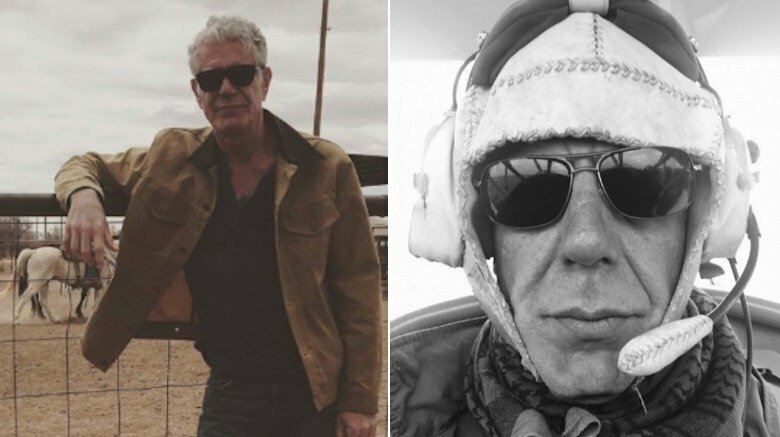 Aside from being a huge Iggy Pop and The Stooges fan, Anthony Bourdain was also a lover of various musical acts, including The Brian Jonestown Massacre and soul singer Marvin Gaye. The chef told Rolling Stone his eclectic taste could be attributed to growing up in a Leonia, N.J. home that was "filled with music." "My dad was a guy who liked music no matter where it came from. He came home from work with Sgt. Pepper's, Disraeli Gears, Janis Joplin. He took me to shows at the Fillmore East — Hendrix, the Allman Brothers, Frank Zappa — and would sit there with me…" Bourdain told Men's Journal. He also infused his love for music into his television shows by interviewing musicians, including Queens of the Stone Age, who appeared on episodes of No Reservations. 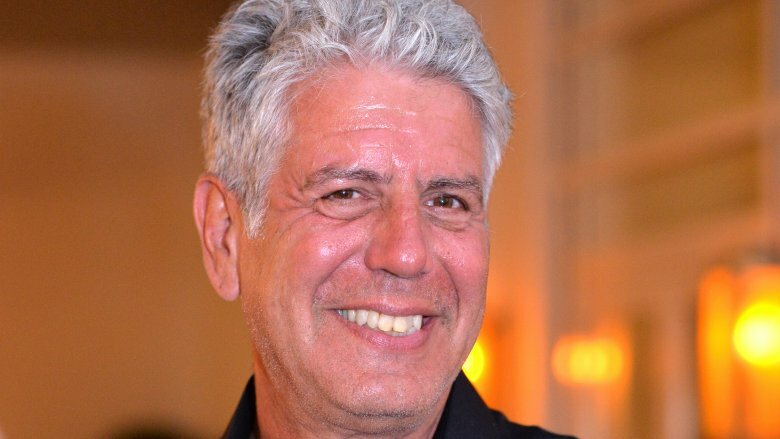 Despite having a jam-packed schedule, Bourdain still managed to give back to those in need. He even made a teenage cancer patient's dream come true. Ali Allouche told People magazine he was going through chemotherapy when his mom suggested he find something else to focus his attention on instead of the illness. While watching an episode of Parts Unknown, they came up with a great idea. "I said what if I try to do something like he's doing and I went to a restaurant in every state in the U.S. to travel and get the experience and meet people like he does," Allouche said. The family started a GoFundMe page to raise funds for the culinary adventure. 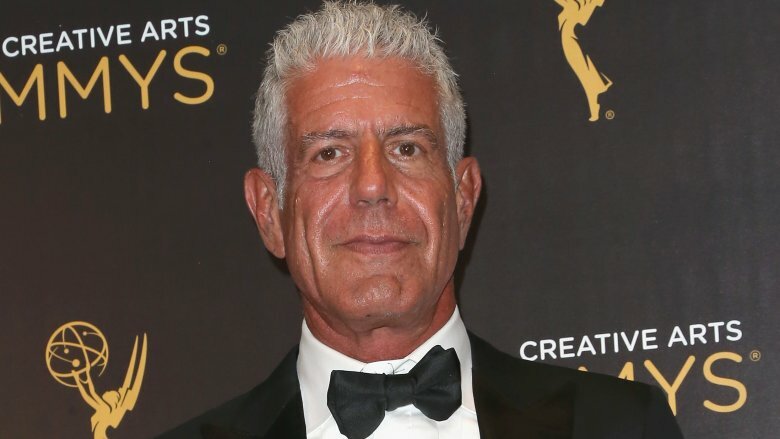 The fundraiser garnered online attention and reportedly caught Bourdain's eye. The TV personality donated the remaining $4,000 to help Allouche reach his $50,000 goal. Allouche and his mom set out on their trip in October 2017 and made their first stop at a Virginia restaurant. The chef at that restaurant invited Allouche and his mom to return for a Christmas Eve dinner at his home. Once there, a surprise FaceTime chat between Bourdain and Allouche commenced. "I said, thanks for donating and told him my map is based on what you do. I was in utter shock. It was amazing," Allouche recalled. It was clear Bourdain was madly in love with Asia Argento. When he wasn't documenting his projects on his Instagram account, he was gushing about the Italian actress and director and explaining the important role she played in his life. "Just a perfect day. You made me forget myself," he captioned a photo of him alongside Argento in April 2018. According to a friend of the late chef, Bourdain's love for Argento went far deeper than the public grasped. 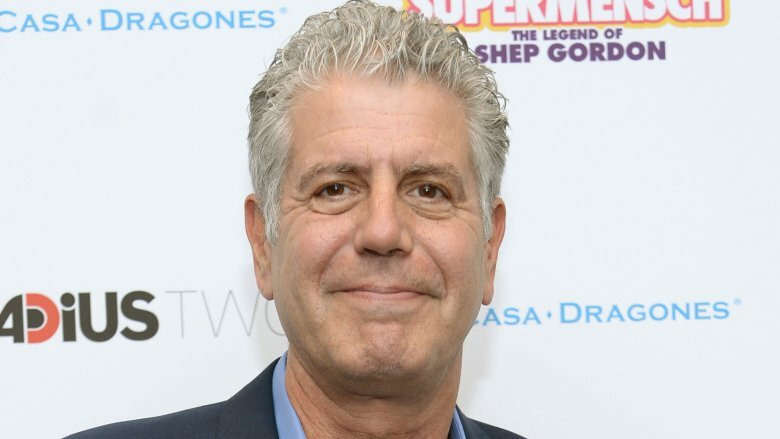 One insider likened Bourdain's feelings to "a teenage boy just absolutely lovestruck," telling People, "He would have done anything for her, and that was a little red flag for some of his friends." Being in love is an amazing feeling, but those closest to Bourdain were allegedly a bit alarmed by just how smitten he appeared to be. "Like, he was crazy in love with her, crazy being the keyword," the insider said. He may have left his hometown of Leonia, N.J. to embark on his career as an award winning television personality and celebrity chef, but Bourdain never forgot his roots. That's why residents of the Garden State are looking to pay homage to him with a food trail named in his honor. According to NorthJersey.com, Bourdain's favorite eateries "from Fort Lee to Atlantic City" could be part of the official "Anthony Bourdain Food Trail" that was proposed to the state's division of travel and tourism. 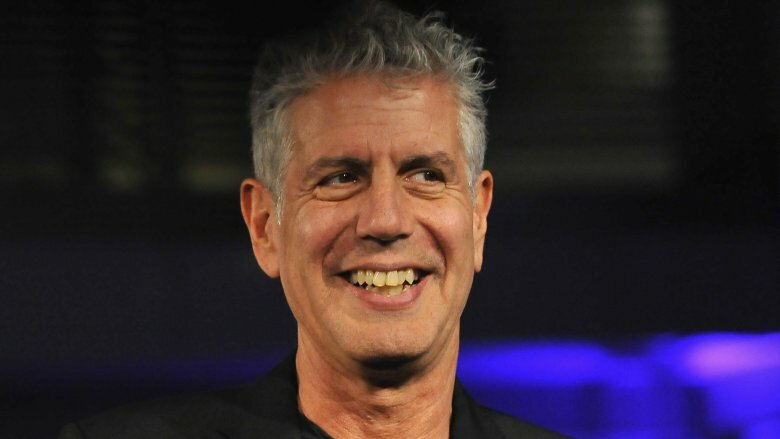 The proposed trail would include the ten eateries Bourdain native visited during a 2015 episode of Parts Unknown – from an oyster house to a salt water taffy establishment. It's a wonderful way to honor Bourdain and the impact he left not only on his hometown but on the entire world. Anthony Bourdain's Twitter attracted millions. Describing himself as simply an "enthusiast" in his social media bio, he took his followers on culinary adventures, sharing photos from his travels and links to his favorite songs. His feed was named one of Twitter's best in 2013 by Time magazine. During an interview with Travel + Leisure, Bourdain revealed that he'd decided to personally craft each and every tweet. He called the platform's previous 140-character limit "exciting and fun," and stated, "It's a whole different language, and I can use it as a means to get immediate feedback from fans or to vent outrage." Upon news of his passing, we can remember the celebrity chef's life through his Twitter and Instagram sites, which leave us with pictures from some of his happiest moments. Our thoughts are with his family and loved ones during this difficult time. If you or anyone you know is having suicidal thoughts, please call or chat online with the National Suicide Prevention Lifeline at 1-800-273-TALK (8255).